Unsure if we would even make it to Vietnam on our tour of Southeast Asia… good friends happened to be in Asia the same time as us, so we decided… screw it! 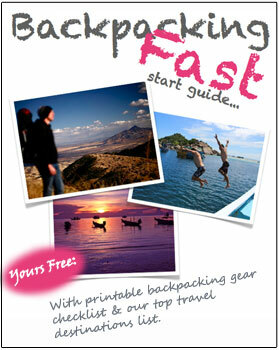 – lets join them on a whirlwind tour of Vietnam. 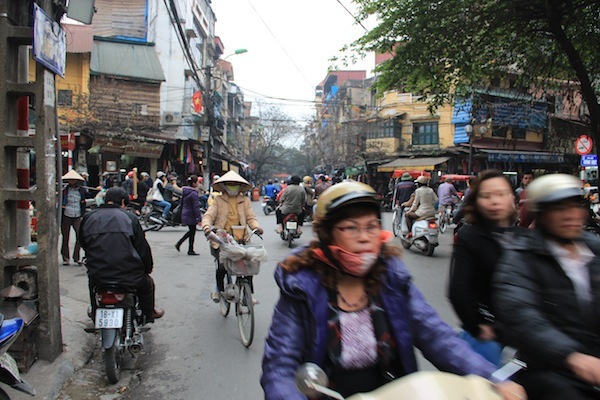 Rendezvousing in Hanoi we planned to head south… ultimately crossing the border into Cambodia and visiting Phnom Penh. After a minor crisis in Bangkok (we popped our “miss a plane flight” cherry) we were forced to spend more than the one night we had planned in Bangkok. For some crazy reason – maybe lack of sleep, it wasn’t until we were in the taxi, 15 mins away from the airport… that we pulled the flight confirmation out to discover we had gotten the departure time completely wrong. Air Asia (who was very good about the whole debacle) slotted us on the next mornings flight to Hanoi… which, you’ll be happy to know we made without instance. 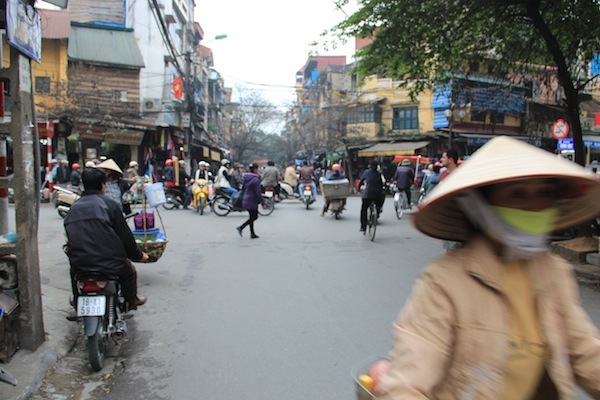 A stark contrast to the sunny tropical Islands we left behind in Thailand – Hanoi was drizzling when we walked off the plane (which unbeknown to us at the time – would set the tone for our entire time in Vietnam). Motorbikes everywhere. Thats what I’ll remember most about Hanoi. Every time you cross the street, you need to be super diligent not to walk in front of one. Every few seconds a horn erupts from a scooter somewhere, setting off a cascade of beeps & toots for reasons that will forever remain a mystery to me. My other memory of Hanoi is of the incredible welcome we received from the warm & friendly staff at the Red Dragon Hotel on Hangbe Street. We had managed to book, by divine luck, the bubbliest friendliest hotel in Vietnam. Upon arrival we were immediately ushered into the restaurant, and forced to eat breakfast (which we weren’t entitled to since we hadn’t even spent the night yet). … starting with an overnight boat cruise in Ha Long Bay & a few days trekking in the remote mountainous village of Sapa – (and most importantly introducing us to Vietnamese Ice Cream). 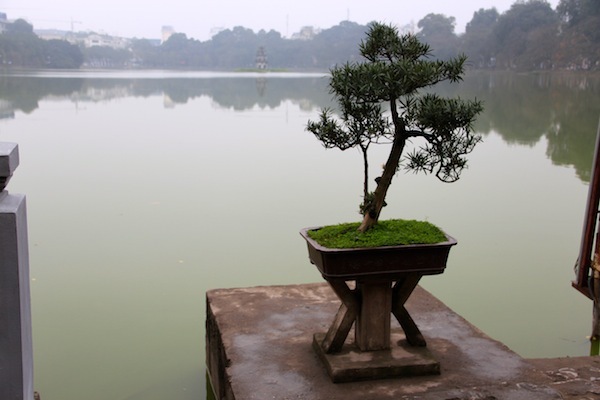 Described as a breath of fresh air in Hanoi, the lake is the best refuge from the mayhem of motorbikes that clog the streets everywhere you go in Hanoi. 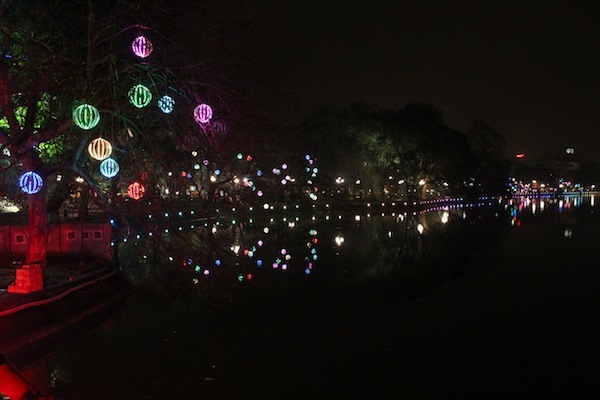 … large baubles the size of beach balls, illuminate the trees on the edge of the lake and reflect off the waters surface creating quite a scene. … conspicuously staring at his Nikes while moving closer & closer, we were all completely confused as to what this guy could possibly want – initially I pondered whether he’d ever seen a real pair of Nikes before. The situation got even stranger when the guy dropped down to his hands & knees and produced a pot of glue… stunned & silent, we all stared at each other wondering what could possibly happen next? A new Southeast Asia scam – (you come across new scams in just about every city) this particular scam aims to extract money out of unsuspecting tourists pockets by forcing services (glueing imaginary holes in perfectly good shoes) onto victims who are too slow to realise what’s happening until it’s too late. This was the first time we’d seen this particular scam unfold – so it pays to keep your wits about you. 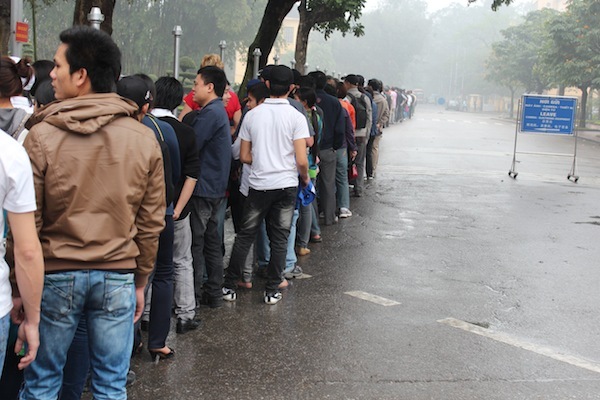 Determined not to let the relentless drizzle hamper our experience of Hanoi… we made our way to Ho Chi Minh’s Mausoleum & joined the massive line of people waiting to set eyes on the man the Vietnamese revere so deeply. Inside an impressive building that’s well guarded with machine guns… Ho Chi Minh himself looks like he’s having an afternoon siesta… with a rug pulled up to his waist & his easily recognisable white hair still well intact. You get a glance at his former home, and an insight into the simple life he led… with few possessions in a very modest timber house on stilts, with a bedroom, an office and not much else. And we never did find out what the opening hours really are – it seems like they just close it when they feel like it, so get there early to avoid disappointment. I was pretty excited by the prospect of learning more about the war in Vietnam. Actually being in the country first hand where the fighting took place – is an entirely different prospect to learning about something from a text book. 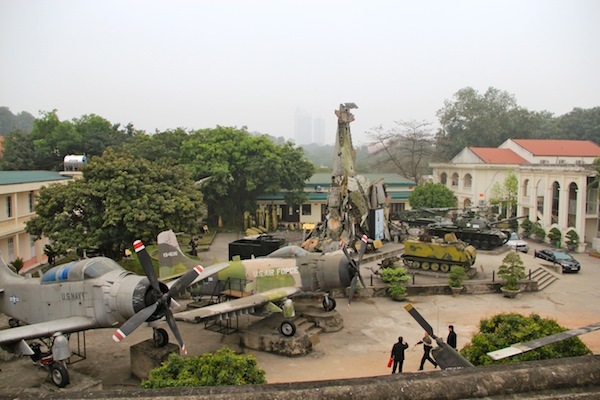 Although interesting – as was expected, the war museum in Hanoi has a slightly more than one-sided theme. What I considered to be aggressive and distasteful language, is used often to describe photos of American soldiers being killed or killing. Distasteful photo captions aside, visitors can get up close and personal with a bevy of captured US & French war machines, including planes used by the Navy & the Airforce, helicopters and tanks. US bomb casings are also on display along with how many tons of each bomb was dropped on Vietnam during the war (figures quantified by the Vietnamese I’m sure). 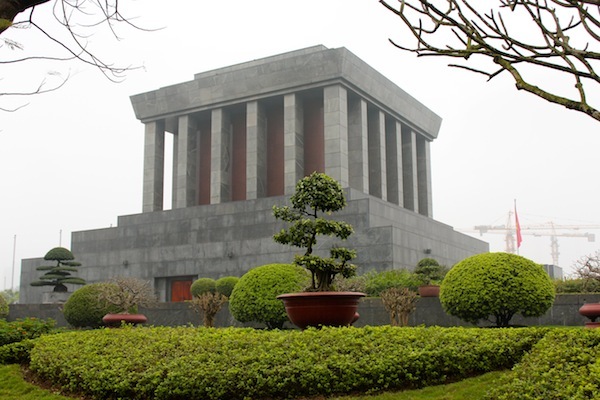 This is also where the tank is housed that famously crashed through the Presidential Palace gates in Saigon on April 30 1975… officially ending the war & marking the official liberation of Vietnam. We didn’t know it at the time… but the missed flight from Bangkok to Hanoi, was the catalyst for a series of unfortunate events & circumstance that dogged most of our trip to Vietnam. After exploring Hanoi for a few days, we set out to spend 1 night – 2 days on a boat cruising on the World Famous, Unesco listed Ha Long Bay. After a rough & tumble 4 hour bus ride south to the bay… we boarded the boat in less than favourable weather conditions (we could barely see our feet through the fog) and sat down to an impressive and delicious seafood meal. After lunch many of the guests retired to their rooms to sleep off the effects of a horror bus ride, & a big meal helped down with a few cheeky drinks. 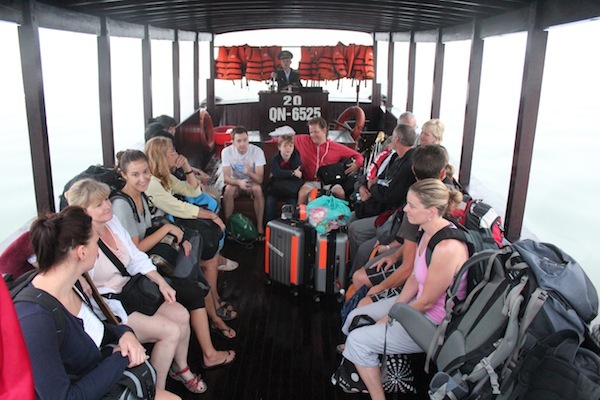 The terrible weather conditions had put an end to our Cruise in Ha Long Bay before it had begun… and could we please pack up our things and meet back in the main area of the boat so we could disembark & make the dreaded 4 hour mini-bus journey back to Hanoi. Us, or the young American family who explained how their two young boys had burst into tears when they heard they wouldn’t be going sailing out on the bay. Back at the Rising Dragon Hotel (the shining light of our trip to Vietnam) late that night… the staff ran around like crazy when we returned… apologising profusely & doing everything they could to make us feel better about the failed boat cruise. 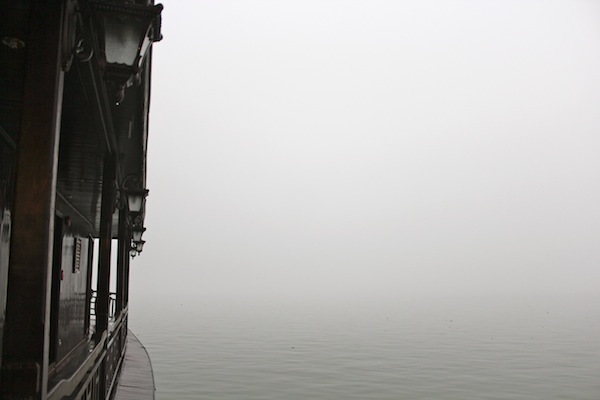 The next evening (when we were supposed to be returning from Ha Long Bay) we boarded a sleeper train…making an 11 hour journey to Sapa – (A bit of fog can’t stop a train we joked – our sense of humour returning after the attempted boat cruise).